FILE - A man walks past a woman who sits by a wall with graffiti that mocks Indian politicians ahead of the general election in Kolkata, India, Apr. 1, 2019. Facebook’s announcement this week that it has taken down hundreds of pages linked to India’s main opposition Congress party and the ruling Bharatiya Janata Party turned the spoltight on the blitz of disinformation being used to influence nearly 900 million voters as social media becomes the primary battleground in the world’s largest general election starting April 11. “It really huge, to put it mildly. Your audience has entirely moved to social media,” says Kanchan Kaur, a Bengaluru-based assessor at International Fact-Checking Network at the U.S.-based Poynter Institute. 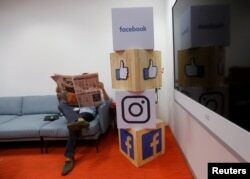 FILE - A man reads a newspaper at the reception area of Facebook's new office in Mumbai, India, May 27, 2016. Those policing social media content say steps being taken by social media giants to curb fake news are not even scratching the surface of the problem as false posts are shared faster than they can be taken down. The concern in India say cyber experts, is not foreign interference as in the 2016 United States election, but disinformation battles waged by political parties and their supporters. Spending on creating political messages, memes and videos has soared as political parties hire hundreds of cyber warriors to run their social media cells and motivate tens of thousands of volunteers to target the over 300 million who use Facebook and about 240 million on WhatsApp. The upcoming Indian election is a no-holds-barred contest as Prime Minister Narendra Modi’s Hindu nationalist BJP fights to stay in power and the Congress Party to return to the center of Indian politics. 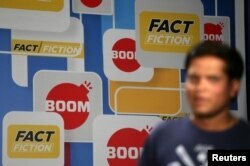 A crew member walks in front of a hoarding displaying the logo of BOOM, one of Facebook Inc's fact-checking partners in India, at a studio in Mumbai, India, March 12, 2019. The greatest worry, says Jency Jacob, who heads fact checking website, Boom, is “the blatant misuse of old videos and images to suggest that one political party or leader is not good for the country. Most people don’t have the inclination to go back and check whether what they are seeing is true or not.” Boom is partnering with Facebook in countering fake news. Fake news and hyper nationalist videos and texts proliferated to unprecedented levels in the aftermath of recent tensions between India and Pakistan following a suicide bombing in Indian Kashmir, say fact checkers. Some examples: a Facebook user shared a recording of a call in which the BJP head, Amit Shah, is allegedly heard saying that “We agree that for election, we need a war”. The fake post, meant to show the BJP indulging in war mongering for electoral gains, had used spliced audio from older interviews. It was seen by 2.5 million viewers and shared many times before being taken down. FILE - A WhatsApp-Reliance Jio representative explains how to use Facebook Inc's WhatsApp messenger to a woman during a drive by the two companies to educate users, on the outskirts of Kolkata, India, Oct. 9, 2018. On the other side of the spectrum, a message spread via Whats App portrayed the opposition Congress Party as soft on militancy. It claimed that a party leader had promised money to free “terrorists” and “stone pelters” from prison if voted to power. It was later flagged as false. Other posts that have been debunked: claims that Prime Minister Narendra Modi topped the list of 50 most honest politicians; a photshopped image of Priyanka Gandhi Vadra of the Congress Party wearing a cross intended to show her as a non-Hindu in an increasingly polarized election campaign. Of greatest worry are those that have the potential to trigger communal tensions. A recent video falsely showed a mock drill at a temple in Gujarat as an incident involving two terrorists. “We are working hard to fight the spread of false news on the platform through a combination of technology and human review,” Facebook said in a recent press release. It has partnered with seven media groups and fact checking organizations to counter false news and ramped up efforts to block fake accounts. On Tuesday, WhatsApp launched a helpline called CheckPoint tipline for users to check out the authenticity of information circulated on the platform. It has also carried out public education programs to help people identify rumors. “These are all useful steps. I think they are coming in a bit late but I don’t think they are sufficient,” says Nikhil Pahwa, digital rights activist and editor of MediaNama. Indeed even as fact checkers work overtime, cyber experts say they lack the capacity and speed to check the fake news that proliferates on social media. WhatsApp efforts to limit the spread of misinformation by restricting forwards in India has been easily circumvented by political parties who use their army of volunteers to create tens of thousands of groups on the messaging platform that is hugely popular among Indians. Instagram is the latest social media platform being used to target young, first-time voters who number 90 million. There are no answers on how deep will be the influence of fake news on social media in the upcoming elections, but its ability to manipulate opinion is a cause of worry. “I think the ramifications of disinformation and even humor in a political context are fairly significant,” according to Pahwa. Can Priyanka Gandhi Vadra Help Dent Modi's Popularity?